Where do I use my Wooden Supplies voucher code? With an enviable reputation in the industry, Wooden Supplies pride themselves on being the best in the business with their second to none Quality service, Good stock levels and efficient delivery service. For over 25 years, Wooden Supplies has been manufacturing Fencing, Decking and Landscaping products as well as bespoke joinery products from their warehouse in the beautiful location of Harlestone Firs, Northamptonshire. Discover the superb selection of quality garden landscape which boasts deck boards, stair string materials, fence panels and hurdles as well as sleepers, cladding and a selection of garden furniture. With a long pedigree, dating back over 100 years, Woode Supplies have evolved from a traditional sawmill into one of the country’s leading suppliers of timber, joinery, fencing & landscaping products. With this in mind, you can shop with ease knowing you’re in the best hands for all your garden needs. What’s more, expect a 2-year warranty on traditional panels and bespoke joinery items. Shop the range today and don’t hesitate to add one of our money-saving Voucher Codes onto your order at the checkout! Wooden Supplies can proudly source your entire garden fencing needs boasting a huge selection of fencing materials for garden boundary fencing! Shop everything from ready-made fence panels including overlap, featheredge, Hit & Miss, arched and horizontal styles and many more - all available in a range of sizes. What’s more, they can also supply everything you need to build your own garden fencing, plus accessories like fence posts, fencing paints and stains to ensure it looks professional! Wooden Supplies are confident that you will find everything you need to complete your garden fence project from start to finish so check out the range today to get started. Complete with quality decking boards in both softwood and hardwood, Wooden Supplies in your own stop decking supplies shop! Discover the range of composite garden decking as well as timber outdoor decking including decking accessories, fixings and screws as well as balustrade, handrails, newels and spindles! In addition, you don’t have to worry about spending a fortune of your decking supplies as we here at NetVoucherCodes proudly offer an array of money-saving deals & discounts ready for you to use online right now. Wooden Supplies are the perfect supplier for all your decking materials so check out the collection now. Free Delivery is available in selected delivery zones or order sizes. Delivery can take up to 7 working days. Check out the Delivery Page for more information. Wooden Supplies are specialists in supplying quality fencing, decking and landscaping products as well as a premium range of hardwood and softwood gates. 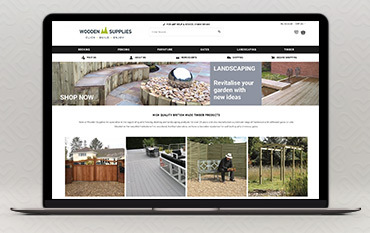 If your looking to spruce up your garden and give your outdoor space that attention it deserves, shop online using one of our Wooden Supplies Voucher Codes to secure money off your next order! As specialists in the industry for over 25 years, you can shop with confidence and guarantee you’re in the best hands when it comes to bespoke joinery.